MTG Commander/Elder Dragon Highlander • View topic - Y'all like Ravnica, right? Post subject: Y'all like Ravnica, right? Post subject: Re: Y'all like Ravnica, right? I thought RTR was pretty good, but the rest of the block meh. The best part is multi-colored, so hopefully they reprint some needed lands and complete some land cycles as well. Who else things the 3rd set will be about the guilds merging / changing into 3 or 4 color groups? I mean, if it ends with Sarkhan getting his revenge on Nicol Bolas, or Garruk getting his revenge on Liliana, or Feather getting a Planeswalker card- I guess I can't complain? Like the dream would be Sarkhan embracing the Firemind in conjunction with his bloodline greensight- literally becoming an elder dragon in human skin. It'd make for some cool art, and an upswing in his character arc. Did Feather become a planeswalker? I don't think she did in the books. A spirit Agrus Kos would be cool. I mean, isn't her defining characteristic that she suddenly disappears every now and then, can't explain it- and somehow a Boros Angel ends up becoming a member of the new Weatherlight? Maybe it's too obvious, and she's lost to the lore 5ever? She didn't magically disappear, she did leave a few times after Agrus freed her though. Later Aurelia overthrew her as Boros Guildmaster. She is definitely not Tiana and i don't think they have any relation besides being r/w angels. 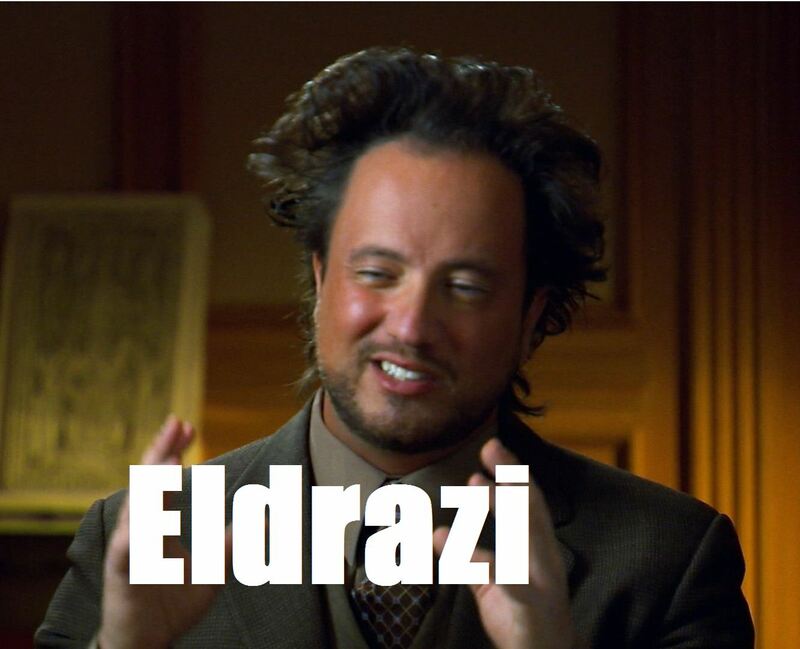 Your theory needs more Eldrazi. I hope Bolas comes in and destroys Ravnica. Fire raining from the skies, seas turn to blood, cats and dogs living together. Utter chaos and destruction. Nothing but smoking ruins and no need to ever visit the plane again. I hope Bolas comes in and destroys Ravnica. Fire raining from the skies, seas turn to blood, cats and dogs living together and ushers in another Ice Age (with new Snow Lands). Utter chaos and destruction. Although, it does make one wonder. Was Ravnica popular because the first block was that good; or because it was good in comparison to Kamigawa (that had just finished)? RTR was okay, but the mistakes still leave a sour note in my memory of the block (e.g. Emmara Tandris as Selsnya Legendary, Maze <x> cycle of mono-color that buffs multi-color?! ?, etc.). Not looking forward to these sets, and I say that as someone whose favorite block is OG Ravnica (has it really been 13 years already? Jesus...). The problem is that we already know the overall shape of the block because the first two sets will be about the guilds and the guilds are static in their interpretation. Worse, the way the guilds are built is the standard or default way those color pairs operate these days - that is, Boros is aggressive weenie aggro in basically every set, Gruul is stompy ramp aggro in basically every set, Azorius is tempo flying things in basically every set, etc. There's nothing unique or interesting left to do with the place. B/G: fertilize: if this card is in your graveyard, you may exile it. If you do, search for a forest or swamp and put it into play tapped. The mana fixing of DRS returns (kind of) with an extra hoop to jump through. The entire RTR block was ok, with Dragon's Maze being the worst of the 3, IMO. Going back there 3 more times, in succession, is certain to exhaust the player base, not to mention the design teams involved. It's too much of a good thing; no one is going to want to go back to Ravnica after the last of these 3 sets... probably for the next 10 years plus. We have so many other interesting places to go to/revisit, nevermind the new ones they come up with... Did they really need to reuse the same place 3 times in a row?? All these different Planeswalker versions are exhausting, especially when the color identity is the same... The flip walker is a refreshing change, but it's not enough to be a "fresh coat of paint" when there are 4 different PW versions of him now.